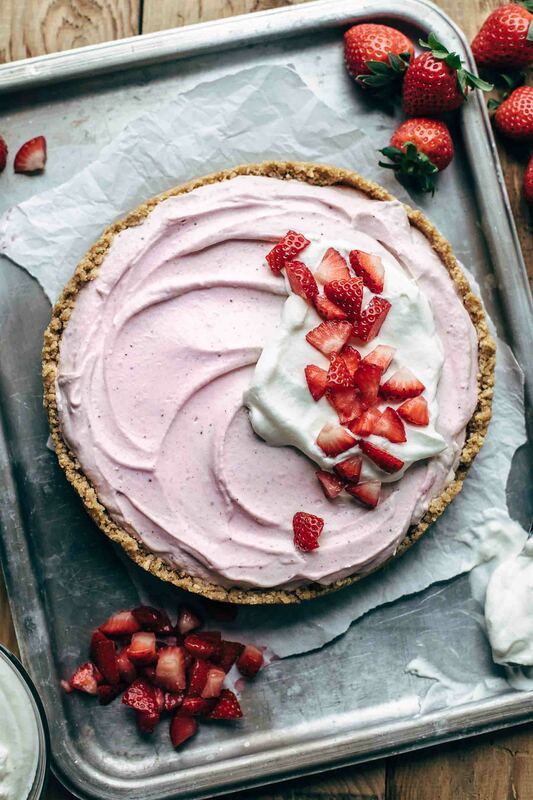 This No-bake Strawberry Cream Cheese Pie recipe is made with a two-ingredient graham cracker crust what is also not baked. You just need 7 ingredients, and it takes 15 minutes of preparation time. Beyond creamy and super easy. You love no-bake recipes as much as I do, don’t ya? You learn how to make a two-ingredient graham cracker crust what is not baked! This is so exciting because how often did you find recipes which are so-called no-bake recipes, and then you find out that you have to bake the crust. Just annoying! We skip that. Trust me on this. The crust will stick together and won’t fall apart into crumbs. The filling is loaded with strawberry flavor thanks to 2 heaping cups of fresh strawberries. Woohoo. This recipe is prepared in just 15 minutes and additional 10 minutes cooking time to reduce the strawberries. The rest will be done by the fridge. You have lots of texture. Crunchy crust meets creamy filling. Texture guys, texture! The taste lets the sun shine on you even if it’s not a sunny today. 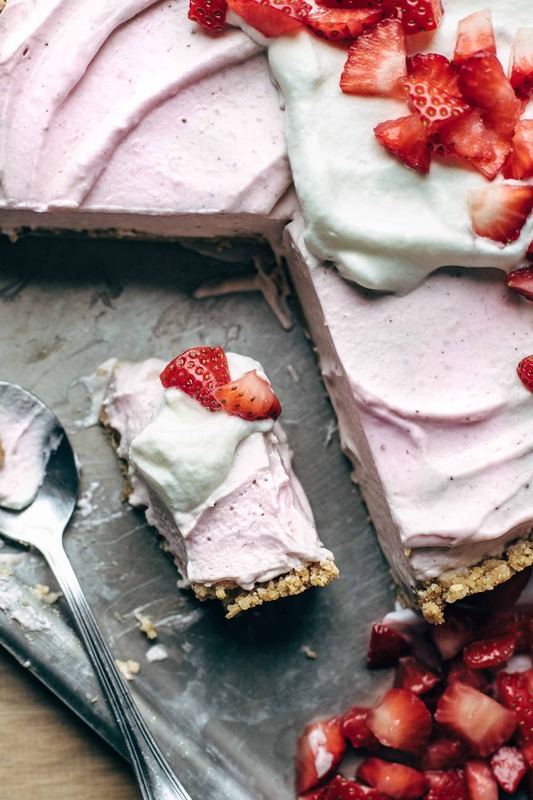 This is the easiest graham cracker crust you will ever make. Stir together graham cracker crumbs and melted butter until combined. Then transfer to a parchment paper layered round 9″ spring pan and press the crumbs into the bottom and the sides of the pan with the back of a measuring cup. Freeze the crust until you are done with the filling. You get graham cracker crumbs by putting graham crackers in a food processor and pulsing a few times or by smashing them with a rolling pin in a zip-lock bag. This process takes you less than 5 minutes. The filling is also super easy to make, and you need 5 ingredients. 2 heaping cups of strawberries are responsible for intense strawberry taste. Sweet strawberries, salty cream cheese flavor, and vanilla beans will let you think that there is a taste-explosion on your tongue. Your taste buds will freak out. To get a super creamy and firm texture, we need to reduce the strawberries by half. This will take about 10 minutes cooking time over medium-high heat. I don’t know how about you but I’m totally stupid about whipped cream. So guess what. 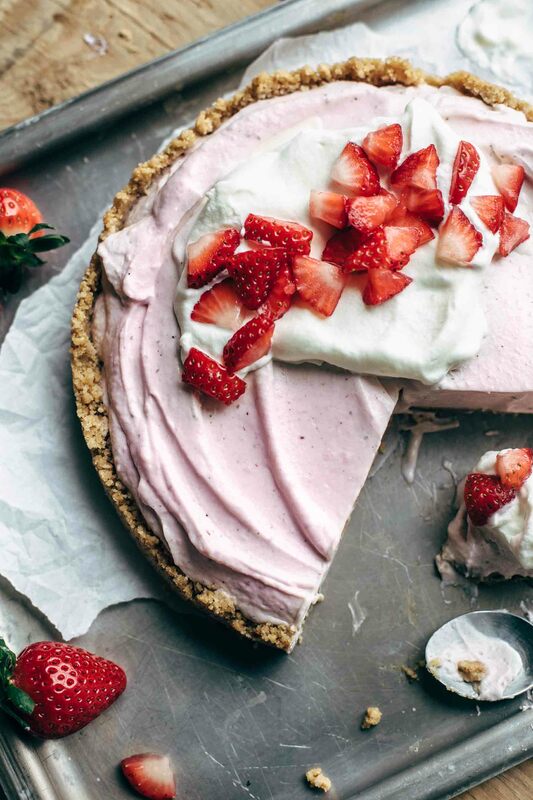 I put lots of whipped cream and fresh strawberries on top of this No-Bake Strawberry Cream Cheese Pie. 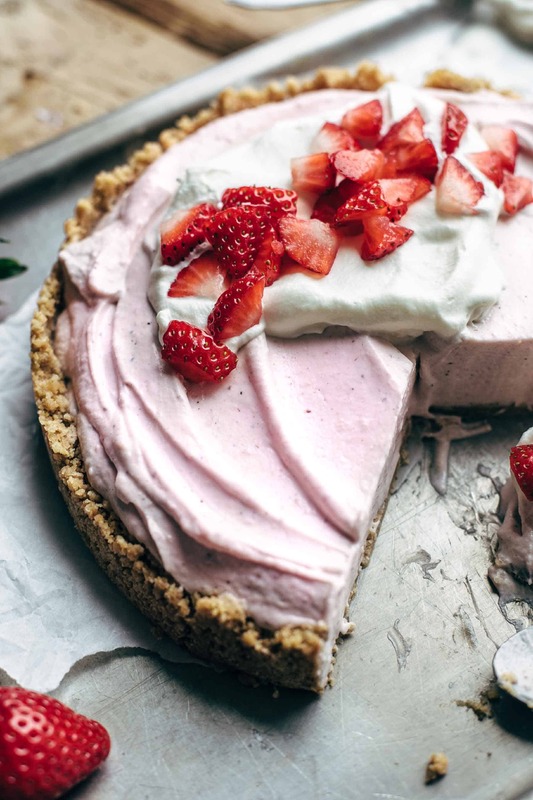 The combination of the crunchy graham cracker crust together with the sweet and creamy filling, airy whipped cream, and fresh and juicy strawberries on top are out of this world. I cannot describe how delicious this dessert is. Obviously, there is just one single way that you get a clue what I’m talking about. You need to try this recipe. 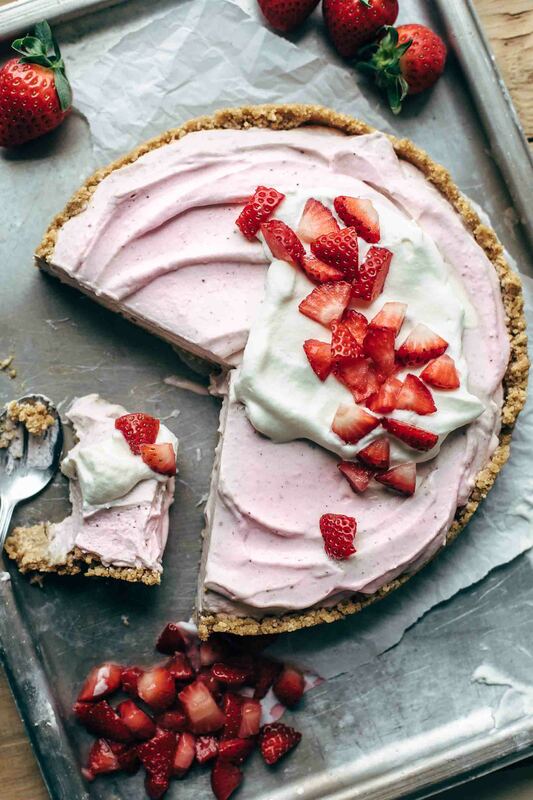 If you make this No-Bake Strawberry Cream Cheese Pie recipe, leave a comment, rate it and tag a photo #alsothecrumbsplease on Instagram! Would love to see your snap! 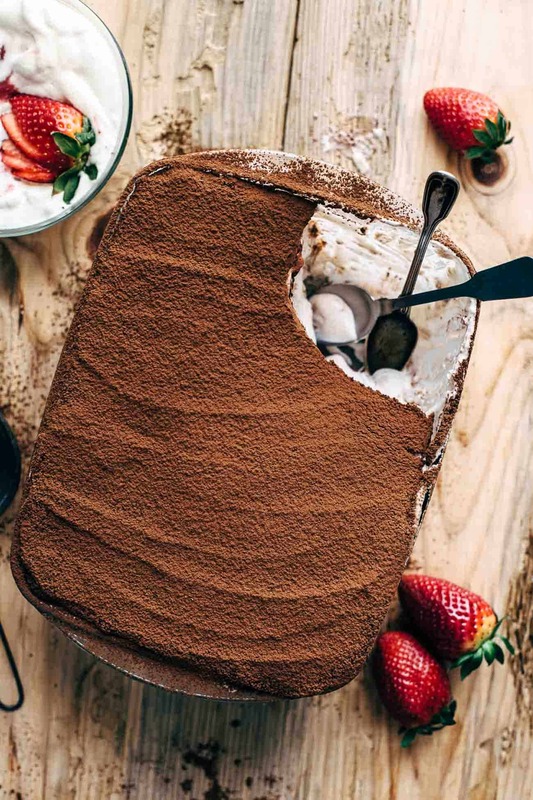 You may also like My Favorite Strawberry Rhubarb Pie, Super creamy Chocolate Strawberry Tiramisu, or click here to see all things sweet. 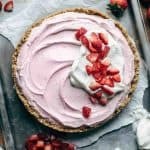 This No-bake Strawberry Cream Cheese Pie recipe is made with a two-ingredient graham cracker crust what is also not baked. You just need 7 ingredients, and it takes 15 minutes preparation time. Beyond creamy and super easy. Blend strawberries with a hand blender until smooth. Place a medium saucepan over medium-high heat and set a fine mesh strainer on top. Pour strawberries through the strainer into the saucepan. Press fruit and liquid through the strainer and discard solids. Bring to a boil for about 5-10 minutes until it is reduced by half. Transfer to a bowl and let cool to room temperature. In a large bowl, stir together graham cracker crumbs and melted butter just until combined. Transfer to a parchment paper layered 9" round spring pan. Evenly press crumbs into the bottom and the sides of the pan with the back of a measuring cup. Freeze for about 10 minutes. Meanwhile, make the filling. 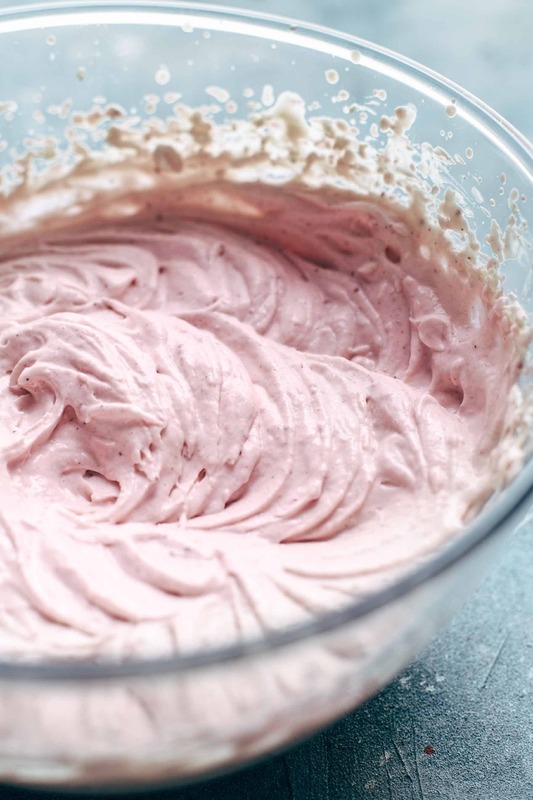 In a large mixing bowl mix with a handheld or stand mixer fitted with a whisk attachment cream cheese on medium speed until creamy for about 1 minute. Add strawberries, sugar, and vanilla* and mix until smooth. Add heavy whipping cream and mix until soft peaks form for about 1-2 minutes. Pour filling into crust and chill in the fridge for at least 4 hours until the filling is firm. Serve with whipped cream and strawberries on top if desired. Store leftovers in an airtight container in the fridge up to 2 days. I need this. So bad. I would love to share with you! You did an absolutely gorgeous job with this. Really pretty styling and photo. Paige, thank you for your nice words. This really means a lot to me. Have a great weekend! I love your photos! I could probably eat the whole thing myself! This is so nice, Karly! Thank you so much. Haha, I could eat the whole thing myself too, if I didn’t have to share with my husband. The crust is really awesomely easy. Thank you so much, Albert! Is the 1/2 c heavy cream already made when mixed in with the filling? No, add the liquid cream and mix until soft peaks form. I currently have mine sitting in the fridge to set, but just by tasting the bits of cream filling left in the bowl I can already tell it’s going to be delicious. I did overblend the biscuits (I used digestive biscuits), so the base isn’t the best, but I’m looking forward to it regardless. I’m sure it’s going to be delicious with digestive biscuits. Even if it crumbles apart, it’s still delicious. And this is what really matters, right? Thank you so much for your feedback and have a wonderful Valentine’s Day!